AP250L - G & W Machinery Sales, Inc. 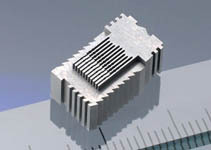 The AP250L Wire EDM features Sodick’s Linear Motor Technology. 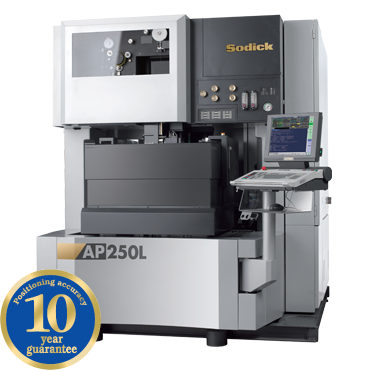 The AP Series is Sodick’s line of high end, high precision Wire EDM machines. The AP250L is available as an oil or water dielectric machine and features Sodick’s newEco-Cut O technology on the oil dielectric model. Using oil based technology, the AP250L is able to machine carbide and completely eliminate cobalt depletion. This machine offers low specific inductive capacity and a small discharge gap; this is ideal for high precision machining for high speed die applications. The carbide workpiece can be left in the work tank for long periods of time (which is ideal for a shop machining during nights or weekends). Sodick’s AP250L linear motor driven, high precision Wire EDM has improved cutting performance which is ideal for micro machining. The combination of the linear motor drive system and bridge design has vast improvements in positioning and machining accuracy. It takes advantage of backlash-free precise axis movement, while minimizing the deformation of the machine structure. High levels of initial machining accuracy can be maintained for a long period of time. Sodick offers a 10-Year positioning accuracy guarantee 10-Year Positioning Accuracy Guarantee to ensure that customers can make sure of Sodick EDMs with a sense of security. The AP250L Wire EDM features the newly developed LN1W power supply unit and utilizes “Perfect Active Control” technology. It also uses 1 Gbit/sec serial communication technology featuring high-speed processing of the discharge control and motion control in a simultaneous process. The AP Series features energy-saving designs and technologies. Compared to conventional EDMs, the Sodick Wire EDM Range can reduce average energy consumption by up to 60%. Eco-Cut O is a newly developed technology by Sodick, and is now available on the AP250L. This technology enables the EDM to machine at incredible speeds using oil technology. Eco-Cut O allows the user to get the optimal surface finish of oil dielectric with the speeds of water dielectric – and faster. Eco-Cut O can increase machining speeds up to 12% over water dielectric and up to 25% over conventional oil dielectric. Eco-Cut O speeds up the cutting process due to the accuracy and surface finish being obtained at a faster pace requiring less cuts to be made to the part. The new high speed, automatic, annealing wire threader improves wire straightness which increases the AWT repeatability especially at larger Z heights. During the annealing process, the wire is heated, stretched and cut to a sharp point resulting in a smaller required wire guide clearance improving part accuracy. Since the annealing AWT can thread in the submerged mode, the worktank does not have to be drained when wire threading. The Z axis position will automatically set the dielectric fluid for the operator. Cobalt depletion of carbide is eliminated when using oil dielectric, which is not possible with water dielectric, due to the corrosion and the electrolysis caused by water. A carbide workpiece can be left in the work tank for long periods of time (which is ideal for a shop machining during nights and weekends). With water dielectric, the workpiece has to be removed immediately when machining is completed or the water will cause corrosion. With oil, the gap between the wire and workpiece is smaller to the the lower intensity of the spark, which is ideal for precision machining for high speed die applications. The 3-sided rise/fall worktank ensures a large set-up space and ergonomic accessibility. Since 3 sides slide down, the machine requires less operating space. The no-drip feature insures a clean shop floor, maintaining a safe work environment. The fluid level is automatically adjusted according to the workpiece thickness and the operator can easily check machining progress even on thin workpieces because the slide tank can be stopped in intermediate positions while machining.